Pamela R. Russell wrote and produced the biblical substance abuse counseling materials known as Almond Tree, and she conducted training seminars around the world for several years. 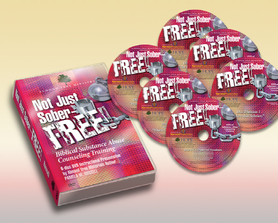 Now HBCC is pleased to an­nounce a 6-disc DVD al­bum of Pam’s final training session, titled Not Just Sober—FREE! You will find that Not Just Sober— FREE will be of great assistance to your group as you plan the use of Almond Tree materials in your local addiction-counseling program. The set is priced at $110 plus shipping/handling. Use the order form button at the bottom of this page to contact us and indicate how you choose to pay (check or charge). Find out what the Bible teaches about anger through a series of character studies. Look at Cain, Esau, Moses, Martha, Herodias, plus many more, and discover the root and fruit of anger. Learn not just how to manage, but how to have complete victory over anger.